Scientists at zonal agricultural and horticultural research station of the University at Hiriyur have developed a disease resistant and high yield variety of castor seed called HCH-6 (Hybrid Castor Hiriyur) which is a fusion of DPC-9 and TMV-6 varieties. The yield of the variety is said to be around 18 quintals per hectare while it is around 13-14 quintals per hectare in other existing varieties. 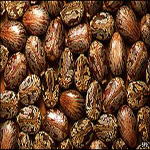 This entry was posted in Castor Research, Castor seeds and tagged Castor Research, castor seeds by Gayathri. Bookmark the permalink.